AIT - Austrian Institute of Technology, Österreichisches Forschungs- und Prüfzentrum Arsenal Ges.m.b.H. AIT takes a leading position in the Austrian innovation system and a key role in Europe as the RTO focusing on the key infrastructure topics of the future. AIT enables innovation through its scientific-technological expertise, application-oriented competencies, excellent customer relationships with industry and high quality research infrastructure. With more than 50 years of experience in laboratory development, research and accredited testing, international research activities are now the basis for an extensive collaboration with industry. In the field of DER AIT is one of the key players in Europe, involved into many European and national research projects (i.e. DISPOWER, DGFACTS, ENIRDGNET, PV‐MIPS, MULTIBAT, DINEMO, DG‐ERANET) as well as member of several relevant national and international organizations and associations (i.e. CERE, EUREC, EUROTECH, CIRED, CIGRE, IEA-PVPS, IEA-DSM). Furthermore AIT is a core partner in the European Network of Excellence DERLab (Distributed Energy Resources Laboratory). 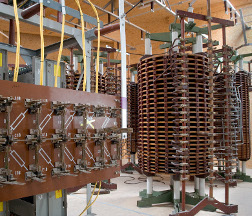 With its comprehensive range of accreditations and research experience in the field of distributed resources, low and high voltage technology, quality, safety and reliability analysis, as well as network simulations together with a long year involvement into international and national standardization, AIT has the capability to actively support the DERri activities.